Maxwell produced numerous winning offspring, as well as, four champions: Angus the Black, Boston Blackie, Sehiya, and Absolute Necessity. 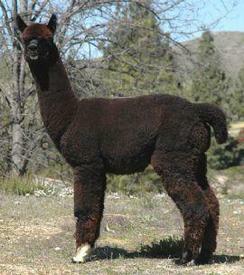 Leda was a blue ribbon winning female who produced several winning offspring. 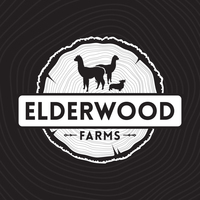 Now standing stud at Elderwood Farms, Angus the Black is a welcomed addition! 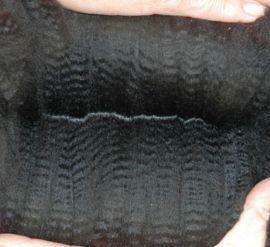 At 12 years old, he is still extremely dense and covered in rich, black fiber from head to toe. He has maintained a soft handle and is still expressing a nice crimp structure. Looking for a male to add bone? Look no further! This guy has the massive, macho structure to share. He has a perfect bite and beautiful head. Angus has wonderful proportions, and has a regal, square stance that we love so much. 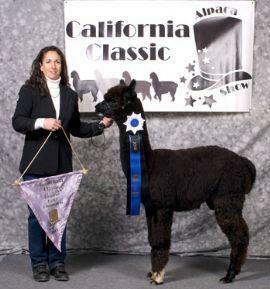 With all these qualities at the age of 12, it's no wonder that Angus did so well in the show ring. 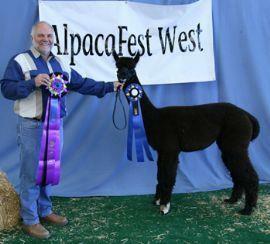 He won the Black Huacaya Championship at the 2006 AlpacaFest West show beating over 20 black males! Angus has a total of 3 banners and 5 blues - not bad for a short show career! 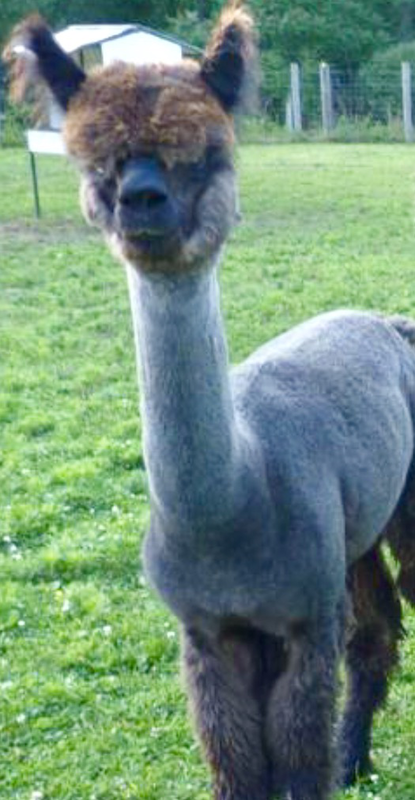 This guy has been described in his younger days as an upright and proud male, boasting outstanding presence and conformation with extreme density and luscious fiber. Angus comes from an impeccable lineage. His sire Maxwell has produced numerous winning offspring and multiple champions. His dam is a blue winning female who has also been a producer of winners. Angus has carried on the best attributes of his parents, AND he's passing them on! The best part? He is 100% unrelated to our herd. Check out his unique genetics. Prices listed are for drive-by breedings. Some of our boys do have the ability to travel for an extra fee. A deposit of $100 will reserve a breeding and execute a contract. Payment in full is required upon the time of breeding. All breedings come with a 30 day live birth guarantee.